Published in Jewish Education 54, 4 (1986), pp. 15-26. 1.What is the nature of the process referred to as “compartmentalization”? 2. What are the essential features of the modern Orthodox approach to religion and the world? 3. What are some of the advantages and disadvantages of compartmentalization when engaged in by modern Orthodox Jews? 4. What might these analyses of “compartmentalization,” “modern Orthodoxy,” and their interrelationship suggest in terms of the direction of educational policy in modern Orthodox day schools? According to M. Singer, compartmentalization entails the delineation by an individual of “separate domains where different standards of conduct and behavior and language apply”2. As the compartmentalizer moves from one domain to the next, he adjusts himself to the cultural frame of reference in which he finds himself. Writing of Brahmin in Madras City, Singer observed that at work, these Hindus mixed with various castes, wore Western clothes, spoke English, and followed European customs. But when at home, they changed to Indian dress, spoke the local Indian dialect, and otherwise conducted themselves as good Hindus. Leibman contends that most American Orthodox Jews also engage in compartmentalization3. He observed that for the most part, they separated their “ritual tradition and belief system” from their “acculturated language, dress, and education.” Many Orthodox Jews in America, who, according to Gittelson, can be identified among the country’s leading “scientists, film stars, journalists, television executives, doctors, lawyers, university professors, and real estate tycoons engage in compartmentalization comparable to that of the Brahmins described by Singer. Rather than residing in one continuous world, they see themselves as participating in multiple environments, constantly alternating between one and the other4. If we conceive of the Orthodox day school as a microcosm of the society that it serves, it is not surprising that Himmelfarb should call attention to the parallel between adult compartmentalization and the educational experience offered by the typical day school. In most of these schools, instructional time is divided into two distinct segments, where part of the day is devoted to Judaic studies and the other to secular disciplines. There are some schools that opt for a departmental approach where a class in Talmud can follow one in mathematics and be followed by another in English literature. But within both organizational schemes, a secular discipline rarely impinges upon or overlaps aspects of the Judaic course of studies and vice versa. The student is exposed to different outlooks, ideas, and ways of thinking as he goes from morning to afternoon, or from class to class. Adult role models are usually clearly identified with either Judaic or general studies, but rarely with both. Extracurricular activities generally reflect the religious or secular orientations of those who organize and conduct them. The day school can therefore be understood to have prepared its graduates to continue compartmentalization during their university studies and well beyond, into their adult lives. Why is compartmentalization accepted and even encouraged in some traditional circles? Ideologically, compartmentalization on the part of Orthodox Jews is rationalized by applying the categories of Kodesh and Chol to the domains of ritual and belief on the one hand, and worldly activities on the other5. This fundamental dichotomy between sacred and profane is reflected in the Halachic differences between Kodashim and Chullin, Mikdash and Gevulin, Eretz Yisroel and Chutz La’Aretz, and Yisroel and the Amim, The Havdalah of Motzei Shabbat that divides the sanctity of the previous 25 hours from the secular quality of the ensuing work week serves as a paradigm for keeping religious considerations distinct from business, social, professional, and academic interests. Psychologically, the Zeitgeist of the post Enlightenment that assigns to religion a limited rather than an all-inclusive role in the lives of its adherents might be another contributor to Orthodox Jewish compartmentalization6. Furthermore, the degree of specialization in all aspects of life demanded by the technological sophistication of modern society also promotes the tendency to view religion as yet another specialty among an individual’s multiple activities7. According to Breslauer, modern man not only specializes in terms of his manifold public roles, but he also compartmentalizes between his social and inner realities8. He deliberately strives to maintain independent control over his belief systems, even while realizing that his social activities are often greatly influenced by outer forces over which he has little control. In addition to ideological and psychological rationales, compartmentalization is justified on a sociological basis as a survival strategy for religious commitment in the modern world. Berger comments that while religious orthodoxy has expected in the past that its adherents take their beliefs “for granted,” questioning as little as possible, such an expectation is no longer viable9, two possible courses of action present themselves to the modern-day religionist. When confronted with multiple lifestyles in a pluralistic, relativistic society, he may decide to evaluate competing belief systems, before making a commitment to one as opposed to another or even deciding in the end to reject them all. While serious thought about religion engendered by the modern conditionally could potentially lead to greater depth of understanding and religious involvement, the opposite result also becomes more of a possibility10. A religious orthodoxy that makes all-encompassing demands upon its faithful is particularly susceptible to being rejected in favor of a more liberal or even irreligious position that allows the individual increased personal freedom and easier acceptance by general society. The alternative to such extensive soul-searching is compartmentalization, which presents the opportunity for the religiously Orthodox to feel that he has not compromised his traditional theological standards, while at the same time he can fully participate in the world around him. If compartmentalization was in fact realizable in a manner that would allow for separate but equal involvement in the best of religious and secular life, then it would be sensible to support and encourage such an approach as a survival technique for religion in a pluralistic society11. According to Heilman, however, compartmentalization often not only entails separation, but also devaluation of at least one of the elements being kept apart from the other12. Either certain aspects of religion will be accorded less importance, or features of modern life and thought will be ignored. Devaluation is necessitated because of the “porousness”13 of modern society in which its diverse elements “leak”14 from one domain to another via the media, social contacts, and professional responsibilities. In the case of Orthodox Jews, the daily newspaper introduces into the home advertisements that promote the materialism of general society; being invited to a business associate’s home for dinner may create numerous Kashrus dilemmas; the scheduling of a professional conference on Shabbat gives rise to another set of conflicts for the observant Jewish participant. Such leakage creates disonance15 for the compartmentalizer between the two worlds that he desires to keep separate. Therefore, in order for him to maintain the delicate balance between his religious and secular pursuits, “the discordant matters are either made peripheral, inattended; or they are actively repressed and forgotten, disattended”16. As a result, some religious individuals approach modernity in purely instrumental terms. For example, the orthodox religionist may take advantage of financial opportunities, advanced and affordable medical treatment, and even technological developments that allow for wide dissemination of religious thought and learning. Yet he will make sure to avoid serious consideration of the implications of modern thought vis-à-vis his religious beliefs. Secular education will be tolerated only as a vocational stepping-stone, rather than viewed as a possible forum wherein the student’s understanding of how the elements in the divinely created universe function and interact with one another. On the other hand, there are those for whom secularism and participation in the modern world are considered the “paramount reality,17” rather than the commitment to religious thought and practice. While unwilling to reject outright their spiritual traditions, these individuals will often make sure to confine their religiosity to familiarity and conformity with the law18. Activities that would allow religion to react as a more central focus in their lives, such as the careful and reflective study of traditional texts in order to better clarify the fundamentals of one’s belief, are assiduously avoided. D. Singer asserts that such people, albeit nominally identifying with Orthodoxy, are in fact “religiously observant secularists” who may be “meticulously observant of the law, but (whose) values and attitudes are shaped by the surrounding secular culture19. 1. Is the ideal graduate in the eyes of the administration, faculty and student body, one who continues to study Torah in a Jewish institution, or one who enrolls in a secular university, or both? 2. How many classroom hours are devoted to Judaic as compared to general studies? 3. When classes have to be canceled in order to allow for extracurricular activities to take place, which subjects are protected, and which subjects is the school prepared to regularly forgo? 4. Is the professional preparation and education of the Limudei Kodesh staff comparable in quality and breadth to that of those teaching Limudei Chol and vice versa? 5. Do the teachers communicate to their students’ proper respect for the disciplines of the department in which they do not teach? 6. Are the grades in all subjects in terms of school awards and acceptances to institutions of higher learning treated with equal significance? 7. Are aspects of traditional Halachic practice- overlooked in favor of taking part in secular activities, e.g., standards on school trips, the type of plays chosen for student performance, or the attire of a school athletic team? Unbalanced approaches to issues such as the distribution of classroom hours, the type of professional training required, for employment, and the importance of evaluations of student classroom performance, contribute to the development of an outlook that might lead to devaluation of either the Jewish or secular worlds, both during and subsequent to a student’s school career. I propose that the attitude regarding the need for compartmentalization and devaluation of the modern world distinguishes between traditional Orthodoxy on the one hand, and modern Orthodoxy on the other. Orthodox and Non-Orthodox Jews20 either attempt to avoid confronting modernity altogether, or once they come to grips with it, reject and drown out the modern world by vociferously asserting their traditionalist beliefs, in contrast to such approaches, modern Orthodoxy aspires21 to interrelate and integrate traditional religion and modernity’s thought and discoveries, rather than isolating them from one another22. The modern Orthodox Jew is expected to not only externally conform to traditional religiosity, but also to have intemalized the values and attitudes associated with orthodoxy. His “modernity” manifests itself in his willingness to participate in modern society rather than in an uncritical acceptance of contemporary values23. Spiro writes, “The modern Orthodox… see it as a Torah obligation to penetrate all of experience; intellectually-and emotionally; to learn all that there is to know about man, about nature, to exercise one’s mind in the development of science and to express one’s talents in the area of the arts. All of this is at once a supplement to the Torah and the extended area in which Torah is to be applied.24” It is my position that the presence of compartmentalization and devaluation of secular studies in Orthodox and Neo-Orthodox schools is entirely consistent with the philosophical positions of these religious movements. But the modern Orthodox school that either openly or indirectly seeks to stress Havdalah25 between Judaic and general studies is unfaithful to the specific religious orientation of the community that it was founded to serve. But is the value of integration of the Jewish and secular worlds as expressed by themodern Orthodox elite shared by the rank and file? Books and articles by analysts of the American Jewish community26 describe contemporary modern Orthodoxy as having little to do with the integrative approaches of Rambam27 and Rav Shimshon Raphael Hirsch28. The approach that considers all knowledge and behavior as potentially relevant to and even an organic pact of Torah is apparently not widely subscribed to by those referring to themselves as “modern Orthodox.” Instead, the religious position of the members of the modern Orthodox community has frequently been categorized29 as on of compromise and apologetics rather than as a progressive vision of Judaism. The majority of modern Orthodox Jews thus stand accused of devaluing not the secular world, but rather Torah and mitzvot. In order to beable to more fully enjoy the possibilities offered by modernity. In my opinion, it is in light of such negative assessments of the status quo of modern Orthodoxy that Himmelfarb’s comment concerning the relationship between the day school and compartmentalization takes on great significance. If compartmentalization were simply the inevitable result of simultaneously living in secular society and attempting to maintain religious commitment, then the process would have to be viewed as a necessary evil. But if Himmelfarb is correct, then the modern Orthodox school itself is undermining rather than supporting the religious outlook that it should be encouraging within its student body. Furthermore, if educational strategies were to be developed that would mitigate against compartmentalization and devaluation, and instead promote integration of the diverse elements comprising the students’ immediate world30 perhaps the modern Orthodox adult culture could also be positively affected31. I would like to consider three approaches to the integration of the Jewish and secular worlds that could possibly provide philosophical guidelines for the development of educational programs in the modern Orthodox day school. They are found in the writings of the universally acknowledged spiritual mentor of modern Orthodoxy, and two of his disciples, who although deeply influenced by their Rebbe’s thought, have nevertheless developed unique, individual perspectives regarding the issue of integration. In my opinion, each of these theoretical approaches in itself is not directly applicable to the day school context for reasons that will be indicated. Nevertheless, an electic could be constructed whereby they could complement one another in addressing the practical problem of education for the modern Orthodox community. HaRav Joseph B. Soloveitchik has been intimately associated with the principle of Torah U’Madah through his writings, lectures, and serving as Rosh HaYeshivah of Yeshiva University. Summing up his understanding of Judaism in a newspaper interview, he stated, “We are committed to God and observing His laws . . . but God also wills us to be committed to mankind in general and to the society in whose midst we live in particular. To find fulfillment, one must partake of the human endeavor”38. In Ish HaHalachah, considered Rav Soloveitchik’s most important statement in terms of his understanding of the ideal traditional Jewish weltanschanung, he elaborates on his conception of the manner in which the Torah scholar, or Halachic Man, is to relate to the “human endeavor.” The author contrasts Halachic Man with two other typologies: Ish HaDat or Homo Religiosus, and Ish HaMadah VeHaHakarah, cognitive man. Ish HaDat is depicted as sanctifying instinct, emotions, and subjectivity in order to seek a reality to be found beyond his this-worldly concrete existence. Ish HaMadah VeHaHakarah, on the other hand, utilizes reason in an attempt to unravel the problems and secrets of the immanent world surrounding him. Rav Soloveitchik maintains that Ish HaHalachah combines elements of both Ish HaDat and Ish HaMadah VeHaHakarah, but nevertheless represents a unique approach to dealing with this-worldly and other worldly realities. ‘The essence of the Halachah, which was received from God, consists of creating an ideal world and cognizing the relationship between that ideal world and our concrete environment in all its visible manifestations and underlying structures . . . an Halachic man orients himself to the entire cosmos and tries to understand it by utilizing an ideal world which he bears in his Halachic consciousness”39. The range of interests that are included by Rav Soloveitchik under the rubric of the “entire cosmos” include the many facets of natures spatial relationships, human and animal biology, sociology, civil law, family life, and human psychology40. Were one to apply Rav Soloveitchik’s model of Halachic Man to an educational program for the modern Orthodox school, the interrelationship between Judaic and secular studies would consist of the perspective and philosophy of Torah in general, and Halachah in particular, being brought to bear on all other disciplines and activities. Secular pursuits intrinsic to the modern experience become means by which the normative ideals of Halachah become concretized and the world consequently sanctified and perfected. The educational program suggested by such an approach would attempt to assist the student to consider from the Torah point of view acquired and developed in his Judaic studies courses, the valuative implications of his general studies and experiences. In my opinion, the major barrier standing in the way of a successful translation of Rav Soloveitchik’s approach into educational policy, is the attitude of the average modern Orthodox student toward Torah. Can the day school educator take for granted that his students are strongly committed to the primacy of Torah as a way of life? Do they accept their premise that all experience is to be evaluated from a Torah perspective? Furthermore even if we optimistically assume that value will have been imbued within the typical cal day school student by the time he begins his high school studies, is there enough time for him to accumulate sufficient Torah knowledge in order to be able to turn an evaluative gaze on the secular disciplines and lifestyles with which he will come into contact in the future? The commitment and breadth and depth of learning necessary for Halachic Man to sanctify his surroundings in the spirit of Rav Soloveitchik’s model would appear to be well beyond the reasonable expectations that day school educators can entertain for their students. Alternate theoretical approaches must considered that will allow us to preserve essence of Rav Soloveitchik’s conception of integration, but will also deal with the problems that his perspective poses for day school education. In two essays, Rav Aharon Lichtenstein,former Rosh Kollel at Yeshiva University, and presently Roth Yeshiva of Yeshivat Har Etzion, presents a different emphasis in his approach to integrating Torah and modernity. Whereas Rav Soloveitchik concerns one self with the manner in which a Torah personality relates to a religiously neutral world in an attempt to impose upon it Halachic sanctification, Rav Lichtenstein addresses the need to create and participate in a society based on Torah. The format in which modern Orthodox individual can “transform his entire universe into one monistic realm (encompassing) the domain of God, Street, and home, the synagogue and shop”41 is by means of participating in Israeli society. In “Religion and State: The Case for Interaction,”42 Rav Lichtenstein maintains that Halachah would reject a compartmentalization of sacred religion and a profane state. In his view, “Halachah is not content with the integration of the secular and the religious into a single harmonious scheme. It demands their interpenetration.”43 Only in the Jewish state do issues such as defense, public health, and the stability of the national economy concern every Jewish citizen, and Judaism is a prime consideration in national and municipal policy decisions. A pristine example of such “interpenetration” is discussed in the essay, “The Ideology of Hesder,44” the program whereby a young Israeli can combine advanced yeshiva studies with army service, is considered by Rav Lichtenstein as an example of the integrative challenges that living in Israeli society presents. (The Hesder program) provides a context within which students can focus upon enhancing their personal spiritual and intellectual growth while yet heeding the call to public service, and it thus enables them to maintain an integrated Jewish existence”45. Noting that working out an appropriate balance between the contemplative and active life, or Torah and Derech Eretz, is not simple, Rav Lichtenstein nevertheless feels that advocates of the Hesder program can be inspired by the precedents set by Moshe Rabbeinu, Yehoshua, David HaMelech, and Rabbi Akiva46. 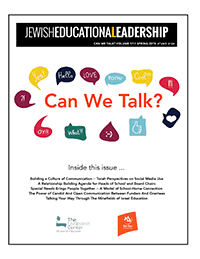 How might the shift in emphasis from projecting Halachic norms on religiously cultural surroundings to helping build a socially integrated life in a Jewish state be translated into a day school educational approach? In one respect, subject matter would chosen on the basis of application to immediate real-life situations in as many curricular areas as possible.47 The student would be made clearly aware that his Torah is meant to lead to concrete implementation in the secular world. Secondly, the role of extra-curricular activities which could students the opportunity to apply and reinforce the Torah values and principles studied in class, would be expanded. Such activities would not be looked upon as diversions from classroom routine, but rather as a laboratory where learning is tested and refined. But as in the case of Rav Soloveitchik’s approach, questions can be similarly raised regarding the position that emerges from Rav Lichtenstein’s presentation of integration. If in fact the only context in which Jewish learning can be appropriately applied to one’s surroundings is a Jewish society, then the logical implication would have to be that the day school has to actively promote Aliyah as a primary educational goal for its students. The extent to which the American modern Orthodox parent body and communal leadership would support such an active policy is questionable. Adults, who are primarily concerned with guaranteeing the future viability of the institutional and social infrastructure that they have striven to develop, may not take kindly to a policy that at least indirectly suggests that the American Jewish community is to be rejected by the day school graduate. Furthermore, although in theory Torah 1m Derech Eretz may be most realizable in the context of Israeli society, Leibman’s descriptions of the different manifestations of Israeli Orthodoxy suggest some of the problems that non-compartmentalization in a Jewish society can entai148. Once again, alternative approaches should be considered in an attempt to respond to the difficulties that both Rav Soloveitchik’s and Rav Lichtenstein’s conceptions of integration present for the modern Orthodox day school situation. Dr. David Hartman, formerly a congregational rabbi in North America, and presently lecturing in philosophy at Hebrew University and heading the Shalom Hartman Institute, calls for another type of integrated approach in his essay, “Halacha as a Ground for Creating a Shared spiritual Language”49. Specifically addressing “all those who are concerned and involved in traditional religious education,” he advocates the need to acquaint the Jewish student not only with Torah, but also allow him to engage in “the experiential and intellectual encounter with modern values and insights50. His role models are clear when he states, “Just as Aristotle aided Maimonides, so does Kierkegaard help (Rav) Soloveitchik plumb new depths in the Halachic experience51, like Rav Lichtenstein’s approach to integration, Hartman’s views are apparently inspired by the challenges presented by living in Israeli society. He is disturbed by the lack of communication between religious and secular Israelis. Hartman assumes that exposure to secular ideas will not only assist the religious individual “to deepen and illuminate his commitment to his own tradition,” by coming to “value and therefore learn from what is different from (him)52 he hopes that such learning will help the religious student respect and engage in open dialogue with those who do not share his religious convictions. Educational policy based upon Hartman’s approach would entail formulating the Judaic studies curriculum whereby the philosophical and social issues that are dealt with in traditional Jewish sources, parallel topics addressed primarily in the humanities aspects of general studies. The focus of the curriculum would become the enhancement of the individual’s understanding of himself and his religious beliefs, thereby allowing him to confidently interact with those who are either unobservant or even members of another faith community. But as in the translations of the approaches of Rav Soloveitchik and Rav Lichtenstein into school policy, certain difficulties are encountered, challenges to the implementation of Hartman’s concept can similarly be raised. As Spero phrased it, the issue of the “economy of souls” has to be grappled with53. Will such a searching, open-ended approach result in weakening the faith of more students, than it will strengthen? And even if the majority of day school students would gain from such an approach, can the educator ignore even the single student whom he may have disconcerted? Whereas the students’ fundamental belief commitments should be enhanced rather than undermined according to the integrative schemes of the first two approaches that were considered, Hartman admits that his call for exposing the religious Jewish student to challenging alternatives to their personal beliefs may prove harmful to particular students54. What we would then have to ask is whether the day school educator’s educational mandate extends to the point of endangering his students’ beliefs, in the name of realizing a potential for greater understanding of self and others? Furthermore, can we reasonably assume that a strategy designed to promote unity within Israeli society is appropriate for Diaspora education? Will the community be in favor of their children being better able to openly interact with non-Jews? And, will every student be sufficiently intellectually and emotionally mature in order to positively respond to the sort of introspective approach that focuses upon belief? Once again, the questions that arise potentially negate the attractions of applying Hartman’s educational ideas to the day school context. A consideration of even some of the respective pros and cons of the integrative approaches toward Torah and modernity presented in this paper reflects the complexity of trying to compose and coordinate an integrated rather than compartmentalized program for a modern Orthodox day school. M. Breuer has amply illustrated how even the S.R. Hirsch Real-Schule in Frankfurt was unable to live up to the goals that its founder wrote about so eloquently55. Nevertheless, a line in Rav Hirsch’s 1854 essay, “Jewish Schooling”56 provides in my opinion a suggestion that could serve as a key to an integrated curriculum. In his monthly journal Yeshurun, Hirsch proposed the establishment of schools “in which equal attention shall be paid to the old sacred inheritance of the community of Jacob, Biblical and Rabbinical knowledge, and to all that is true, noble and good in European culture” (emphasis added). Implicit in this thought is that the student attending a Jewish school is not to be exposed to everything simultaneously, but rather that a selection of material deemed appropriate to his age and level of learning be made. According to Hirsch, the Jewish educator has to construct a complementary relationship between religious and nonreligious culture, rather than approaching modern Jewish education as a dialectical process involving a religious thesis and a secular antithesis. Educators, confronted by the constraint of time and energy, as well as the particular abilities and backgrounds of their students, are always selecting what their classes should and should not be exposed to. General studies subject matter that is inimical to Torah will naturally cause dissonances within the students whose religious outlook has not been firmly established, but who nevertheless desires to commit himself to tradition. On the other hand, after gaining a modicum of familiarity with traditional sources and thought, as well as confidence in the credibility of the Torah’s general outlook, a student will welcome the challenge of confronting alternative approaches and traditions, critically evaluating them, and then carefully determining what is acceptable to and enhances Jewish tradition and what is objectionable. Therefore the questions raised with respect to the approaches of Rav Soloveitchik and Hartman do not absolutely negate the utilization of these outlooks within the day school context; what has to be determined is the timing and the readiness of students to accept the primacy of Halachic Judaism as an evaluative device for all secular phenomena and experience, and the ability to firmly adhere to one’s beliefs while at the same time empathizing with that of another. Careful articulation of a day school program both horizontally and vertically will allow not only the gradual development of learning skills, but also the introduction of non-Jewish culture, first as a reinforcing component of the day school student’s Jewish education, and later as a clarifier and deepener of ideas by means of opposition and contrast. In the formative grades, the constant involvement with particular themes both in Judaic and secular studies will not only promote integrated thinking, but will also gain for Torah learning the credibility that it lacks in the minds of so many students and their parents. Particularly in the light of wide-spread parental and communal devaluation of Torah as a serious discipline, outside projects designed to familiarize the student with the practical aspects of Judaism (as opposed to research projects) and involving adults as much as possible, can positively contribute to individuals becoming more favorably disposed to at least considering what a Torah perspective on a particular issue may happen to be. And as many opportunities as possible should be found to allow for students either singly or as a class to study in Israel where they will be more clearly made aware of the extent to which their Judaic and general studies both coalesce as well as have real applicability. 1Harold S. Himmelfarb, The American Jewish Day School: A Class Study, Presented at Consultation on the Anthropology of the Jewish Classroom, New York, American Jewish Committee, March 16-7, 1980, p. 18. 2Milton Singer, “The Modernization of Religious Beliefs” in Modernization: The Dynamics of Growth, ed. by Myron Weiner, New York: Basic Books, 1966, p. 60. 3Charles S. Leibman, “Orthodox Judaism Today” in Midstream, 25:7, Aug-Sept 1976, p. 25. 4Natalie Gittelson, “American Jews Rediscover Orthodoxy” in The New York Times Magazine, Sept. 30, 1984, p. 60. 6Charles S. Leibman, “Religion and the Chaos of Modernity” in Take Judaism for Example, ed. By Jacob Neusner, Chicago: U. of Chicago Press, 1983. 7See for example, Alvin Toffler, Future Shock, Pan Books, London, 1971, pp. 260-2; 3. 8S. David Breslauer, The Ecumenical Perspective and the Modernization of Jewish Religion, Missoula, Montana: Brown Judaic Studies, 1978, p. 32 (quoted in Leibman, “Religion and the Chaos of Modernity”). 9Peter L. Berger, The Heretical Imperative, Garden City: Anchor, 1980. 10For religious questions engendered specifically by modernity, see for example Norman Lamm, “The Voice of Torah in the Battle of Ideas” in Jewish Life, 34:4, March-April and “Faith and Doubt” in Faith and Doubt, New York: Ktav, 1971, pp. 1,2, 31. 11Leibman advises Conservative and Reform educators to consider emulating Orthodox compartmentalization in “Orthodox Judaism Today,” p. 26. 12Samuel Heilman, “Constructing Orthodoxy” in Society, May-June 1978, p. 38. Although David Singer in “Is Club Med Kosher? Reflections Synthesis and Compartmentalization” in Tradition 21:4, Fall 1985, p. 31 implies that Leibman and Heilman support one another in terms of their concepts of compartmentalization, I would differentiate between them. Leibman does admit that compartmentalization is theologically and halachically indefensible from the perspective of the Orthodox elite (“Orthodox Judaism Today,” p. 25). But my opinion, this is not necessarily the same saying that if synthesis is not the goal, then either the religious or the secular component of the compartmentalizer’s life is per force devalued in on to minimize dissonance. Leibman notes the presence of compartmentalization, but his observation is not only embellished by Heilman’s description the relationship between the worlds being separated rated, but also is subjected to an evaluation of the desirability of the entire process when consider the drawbacks of devaluation. 13Irving Greenberg, “Jewish Values and the Changing American Ethic” in Tradition, 10:1 Summer 1968, reprinted in Dimensions of Orthodox Judaism, ed. by Reuven P. Bulka, New York Ktav, 1983, p.291. 17Berger discussing the theories of Alfred Schutz, pp. 34-6. 18See the description of the neo-Orthodox typology in Michael Rosenak, “Lihyot Tamim HaShem’; Chinuch LeTorah Im Derech Eretz” BeDoreinu, in Nir HaMidrashiyah, 1983-4, Vol. 16-7, pp. 229-230. 20I am using the term “neo-Orthodox” in the sense that it appears in Berger’s discussion of what he refers to as the “Deductive Possibility” by which moderns approach religion in Chapter 3 of The Heretical Imperative rather than “neo Traditionalism” referred to by Leibman “Hitpatchut HaNeo-Mesoratiyut BeKerev Yehudim Ortodoxim BeYisroel” in Megamot, 27:3, May 1982, pp. 232-3, and “Religion and the Chaos o Modernity,” pp. 149-52. 21Although in his 1969 Judaism article, “A Challenge to Orthodoxy” (reprinted in Understanding American Judaism, Vol. II, ed. by Jacob Neusner, New York: Ktav, 1975), Emanuel Rackman disclaims an attempt to categorize modern Orthodoxy as a movement (pp. 178-9), nevertheless a perusal of the articles listed previously in this paper as well as the contents and bibliography of a book like Dimensions of Orthodox Judaism, ed. by Reuven P. Bulka, New York: Ktav, 1983, would lead one to conclude that the situation has changed since the publication of Rackman’s article. 23See for example Greenberg, p. 298; Norman Lamm, “Modern Orthodoxy’s Identity Crisis in Jewish Life”, May-June 1969, p. 6. 25 Such a suggestion is made by Sol Roth in his contribution to the Tradition Symposium, p. 67. Solomon Skaist, in “Definitions of Integration Can Be Misleading” in Jewish Education, 46:4, winter 1978, p. 25, also explicitly denigrates the integration idea for the Orthodox day school. 26In addition to the articles by Leibman, Heilman and Singer already cited, see for example Heilman’s Synagogue Life, Chicago: University of Chicago Press, 1973. 26In addition to the articles by Leibman, Heilman and Singer already cited, see for example Heilman’s Synagogue Life, Chicago: U. of Chicago Press, 1973. 28 Rav Hirsch’s arguments on behalf of integrated Jewish education can be found in his essays, “Jewish Schooling,” “Religious Instruction,” “Hebrew Instruction as General Education,” “Relation of General to Jewish Education,” “Educational Talks I, II, III,” and “Jewish Learning in Practical Life,” in Judaism Eternal, trans. and annotated by Dayan Dr. I. Grunfeld, London: Soncino Press, 1967; his comments on the study and teaching of Torah in Chorev, trans. and annotated by Dayan I. Grunfeld, London: Soncino Press, 1962. While attempts have been made to define Rav Hirsch’s position as an Hora’at Sha’ah that applied only to the community of Germany due to the inroads that Reform and Maskalah had made in that country, as in the essay by Shlomo Danzinger, “A Clarification of R. Hirsch’s Concepts – A Rejoinder” in Tradition, 6:2, Spring-Summer 1964, respected authorities have disagreed. Essays by Yitzchak Heinemann (e.g., “Mechkarim al R. Shimshon Raphael Hirsch, “Tziyon, Shanah 5, Sepher 3-4, Asaph Tadphisim, 1940), Rav Yechiel Weinberg (in Talpiyot, reprinted in Torah U’Madah Reader: Experimental Edition, ed. by Shalom Carmy, Yeshiva University) and Mordechai Breuer (“Shitat Torah Im Derech Eretz BeMishnato shel Shimshon Raphael Hirsch” in HaMa’ayan, Vol. 9, 1969) would appear to bear out that Rav Hirsch was presenting a LeChatchilah rather than Bediavad approach to learning. 29See for example the observations of Hillel Goldberg and David Singer in the Tradition symposium (see fn. 19) as well as the articles “The Ambiguous Modern Orthodox Jew” by Lawrence Kaplan, and “Modern Orthodoxy: An Analysis and a Response” by Chaim Dov Keller in Bulka’s Dimensions of American Orthodox Judaism (see fn. 13,21). 30In a symposium on the Orthodox day school conducted as far back as 1972 (Tradition, 13:1, Summer 1972), Sol Berman (pp. 98-9), David Eliach (pp. 100-2), and Shlomo Riskin (p. 115) noted that there was a significant need for more integrative educational programs in the day school. Almost fifteen years later, these approaches have yet to substantively materialize. Eliach even provides a three-point program by which progress could be made in the area of day school curricular integration: (l) a consortium of Gedolei Torah and educational specialists should be created whereby educational strategies most appropriate to the contemporary day school student could be developed; (2) teacher seminars should be conducted wherein the new approaches proposed by the consortium could be discussed and then brought into the classroom by those in the field; and (3) means for identifying and then training potentially effective teachers for the schools should be sought out. Not only is more of this sort of purposeful thinking needed, but concerted action that would allow for some of these ideas to come to fruition is required if day school education is to fulfill more of its potential. 31Follow-up studies of day school graduates such as undertaken by George Pollak (The Graduates of the Jewish Day School: A Follow-Up Study, Ph.D. thesis, Western Reserve U., 1961), Steven M. Cohen “The Impact of Jewish Education on Jewish Identity and Practice” in Jewish Social Studies, 36:3-4, July-Oct 1974), Geoffrey E. Bock (The Jewish Schooling of American Jews: A Study of Non-Cognitive Educational Effects, Ed. thesis, Harvard U., 1976), and John Siegel, David August, and Joseph Beltempo (“Impact of Jewish Education on Jewish Identification in a Group of Adolescents” in Jewish Social Studies, Vol. 43, 1981) appear to indicate that day school education affects its students in a manner similar to that reflected in studies of Catholic parochial schools and private colleges, i.e., all of these institutions have basically an “accentuating effect.” The attitudes that the student harbors before he enters the school can be deepened, strengthened, but not significantly changed. Therefore, if students’ attitudes are more often than not projections of the attitudes present in the adult surroundings from which they come, then any means by which the adult community’s Jewish values can be changed for the better will bring dividends as well for the success of the day school educational process. It is my contention that if the Gedolei Torah and modern Orthodox leadership become involved in the process of developing educational policy for the day school, the impetus may then be supplied for a rethinking of adult education efforts as well as the nature of the professional preparation of rabbinic and educational personnel. 32For example, concerning the approaches of Rav Hirsch and Rav Kook, see Norman Lamm, “Two Versions of Synthesis” in Faith and Doubt, New York: Ktav, 1971; Lamm’s “The Unity Theme and its Implications for Moderns” in Tradition, 4:1, Fall 1961; Eliezer Berkovits, “An Integrated World View” in Tradition, 5:1, Fall 1962; and Justin Hoffmann’s review of different approaches in “A Traditional View of Liberal Education” in Tradition, 6:1, Fall 1963. 33 Immanuel Jakobovits in the 1982 Tradition symposium (see fn. 19) writes, “There’s not a single school of higher Jewish learning committed to Hirsch’s philosophy anywhere in the world today (Yeshiva University and Bar Ilan represent combination but not a synthesis in the Hirschian sense between Jewish and secular values)” (p. 41). Singer also questions the degree of integration that actually takes place at YU in his contribution to the same article (pp. 70-1). 34 See Joseph H. Lookstein, “True Integration” in Jewish Education, 46:4, Winter 1978, p. 38 for a discussion of this phenomenon. 35Samuel Belkin, quoted by Norman Lamm in “A Perspective for the Eighties- Address to Alumni at the Yeshiva College 50th Anniversary Golden Jubilee Celebration,” May 20, 1979, p. 6. 36See Bennett I. Solomon, “A Critical Review of the Term ‘Integration’ in the Literature of the Jewish Day School in America” in Jewish Education, 46:4, Winter 1978, pp. 4-5 for other motivations that might account for the employment of the slogan, although Skaist (see fn. 25) attributes it exclusively to the attempt to attract a particular type of parent to the day school. 38Edward B. Fiske, “Rabbis’ Rabbi Keeps the Law Up to Date,” in The New York Times, June 23, 1972, p. 74. 39 Rav Joseph B. Soloveitchik, Halachic Man, trans. by Lawrence Kaplan, Philadelphia: Jewish Publication Society, 1983, p. 19. 40 Ibid., pp. 20-3. Although Singer and Solow in “Joseph Soloveitchik: Lonely Man of Faith” in Modern Judaism, Vol. 2, 1982, p. 248) note that “we do not possess a single essay by (Rav) Soloveitchik in which he advocates that Orthodox Jews obtain a secular education,” when one couples the obvious breadth of knowledge evident in the Rav ‘ s writings and Shiurim in both Limudei Kodesh and Chol with Rav Aharon Lichtenstein’s specific references to various disciplines and what they can contribute to the outlook of even one who is placing the great bulk of his efforts in the world of Torah (see Rav Aharon Lichtenstein, “A Consideration of General Studies from a Torah Point of View,” reprinted in Torah U’Madah Reader, see fn. 28), to suggest that Rav Soloveitchik might be less open to an integrative approach to Judaic and General studies than he is reputed to be is open to serious questioning. 41Rav Soloveitchik, “Sacred and Profane: Kodesh and Chol in World Perspectives,” reprinted in Torah U’Madah Reader, p. 24. 42Rav Aharon Lichtenstein, “Religion and State: The Case for Interaction” in Arguments and Doctrines: A Reader of Jewish Thinking in the Aftermath of the Holocaust, ed. by Arthur A. Cohen, New York: Harper and Row, 1970. 44Rav Lichtenstein, “The Ideology of Hesder” in Tradition, 19:3, Fall 1981. 46 Ibid., pp. 204, 6. 47In addition to Herman making such a suggestion in the 1972 symposium on the Orthodox day school (see fn. 30), lrving N. Levitz in “Crisis in Orthodoxy: The Ethical Paradox” (Jewish Life, Fall-Winter 1977-8) discusses how the isolation of day school education from the practical realities of the general community may contribute to ethical and moral lapses in later business and human relationships. 48See Leibman’s discussion of Harchavah VeHishtaltut or Expansionism “Hitpatchut,” pp. 235-7, and “Religion and the Chaos . . .” pp.l58-62 (see fn. 20, 6). 49David Hartman, “Halachah as a Ground for Creating a Shared Spiritual Language” in Tradition, 16:1, summer 1976. 50 Ibid, pp. 9, II. 53Solomon J. Spero, “Halacha as a Ground for Creating a Shared Spiritual Language-A Rejoinder” in Tradition, 16:3, spring 1977. 56Rav Shimshon Raphael Hirsch, Judaism Eternal, p. 156 (see fn. 28).